This is the first in a five part series on the Karnali River. Read an overview of the whole trip here. 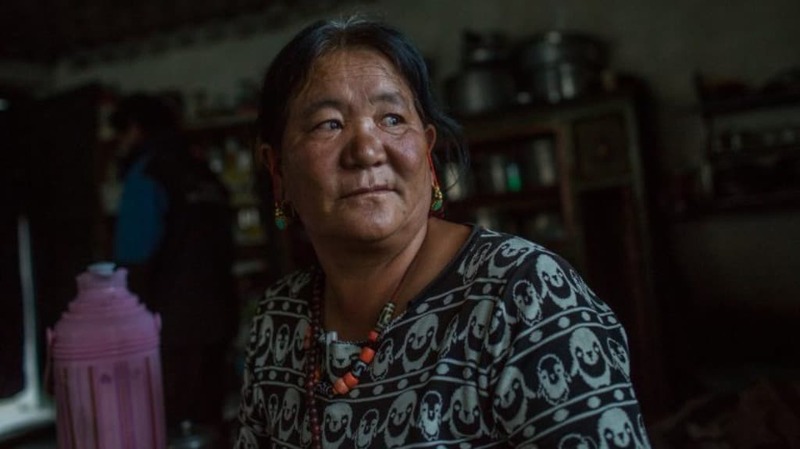 Preparing soup for her grandson under a dim solar powered bulb, 50-year-old Pema Angmo explained how frightening life is on the bank of the Karnali river in western Nepal’s Hilsa village, on the border of Tibet. 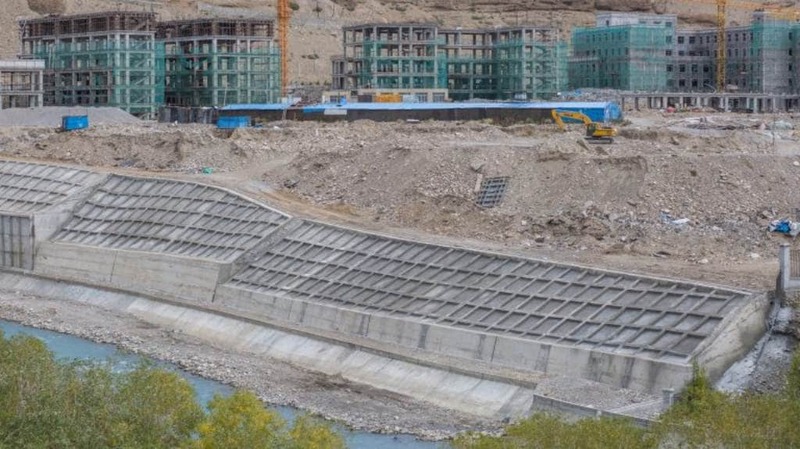 Large embankments protect the huge immigration office and villages in Tibet, but Nepalis on the other bank are left without any protection from the floods. “I tell my relatives in Tibet that the gabion walls (as the embankments are known) protect you, but the gods protect us Nepalis,” she smiled. About two decades ago, she started the first hotel on the flood plains of the Karnali River, which originates about 80 kilometres northwest in Tibet. Now, there are dozens of hotels. This small town is the last stop in Nepal for people visiting Mount Kailash in the Ngari province of southwestern Tibet. 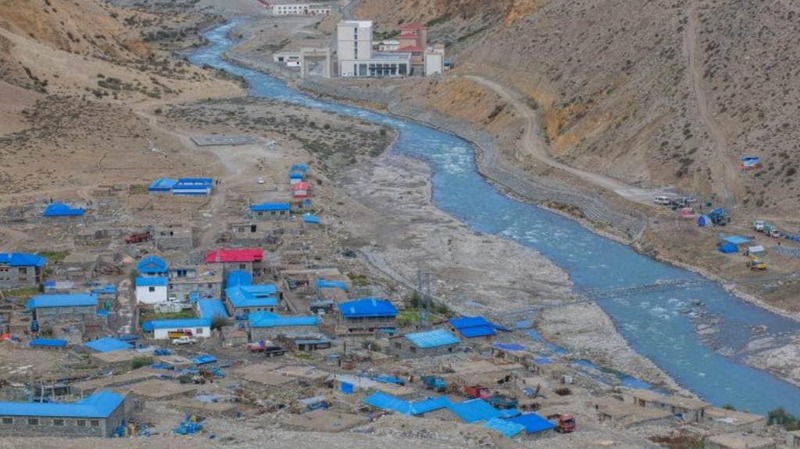 The scale of potential flood threats along the Karnali River is clear from the large embankments constructed in Burang city – 30 kilometres northwest of Hilsa in Tibet. The river, called Mapcha Khambab in Tibet, becomes the Karnali once it enters Nepal. The capital city of Burang county is a trade hub serving people from Nepal’s Humla and Darchula districts, as well as Dharchula in India. Born in Tibet, Pema fell in love with a Nepali from Hepka village in Humla and they married about 30 years ago. As the years passed, Tibet saw unprecedented development, but Nepal has remained the same. Blacktopped roads built in Tibet over the last decade have made road travel much easier there. Many pilgrims — mostly from India, who in the past had to fly to Lhasa in the east and then drive west for hundreds of miles to reach Kailash — started flocking to Hilsa on small planes and helicopters from Nepalgunj in southern Nepal. Mount Kailash is holy for Hindus who believe God Shiva once meditated there. According to the immigration office in Nepal, about 15,000 tourists go to Kailash via this route every year — equivalent to a quarter of the total population in Humla district. The sound of helicopters wake us up every morning as they land and take off every few minutes near Pema’s hotel. Only helicopters can land at this busy airport. While business is getting better, people are worried about how to protect their hard earned property from the floods and disasters that may come in future. 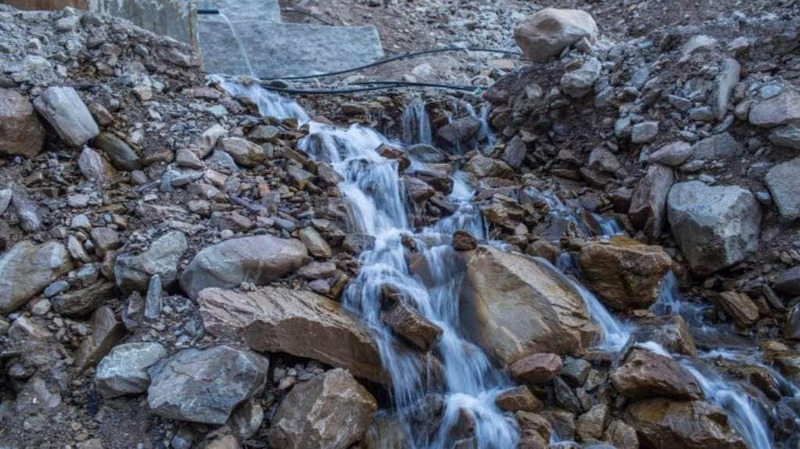 “It took two decades to build these two buildings, but it won’t take a minute to destroy them if there is a big flood or a dam bursts upstream,” Pema added. Interview with Pema Angmo, Hilsa from thethirdpole on Vimeo. The Chinese have built a hydropower dam a few kilometres upstream. This has improved the lives of Tibetans by bringing electricity, but increased fear among the Nepalis living next to the border. “They have built strong embankments on their side, but we have nothing. If the dam bursts, we will be swept away,” Pema said. At first, the villagers in Nepal heard they would also be provided electricity. But later, the local authorities in Tibet said they would need to wait for a formal agreement between China and Nepal. Over the last several years, locals in Hilsa have welcomed the Prime Minister and other leaders and pleaded for electricity. Two years ago, the then Prime Minister of Nepal, Pushpa Kamal Dahal, inaugurated a bridge that linked Nepal and Tibet and promised to send a team of experts to start work on a hydropower project in Nepal on a tributary of the Karnali River at a cost of NPR 30 million (USD 265,090). Two years later, there is no sign of any work starting. “Prime ministers and ministers fly here, make promises and go to Kailash with their family. Once they fly back, they forget everything. They have amnesia. I am really angry, you know, please tell them if you meet them,” Pema Angmo said as we were preparing to film her. Out of the 77 districts of Nepal, Humla is the only district not connected to the national road network. It also lacks electricity and a mobile network. “To go to Nepal’s capital it takes weeks if we walk, costs hundreds of dollars if we fly. Who listens to us?” she said, her frustration spilling over. After a couple of weeks walking along the river to the south, we met Mahendra Bahadur Shahi — the Chief Minister of the Karnali province and asked him if there were any plans to address the problems people face. He had big project plans to talk about, but no answers to the problems Pema faced. “We are talking with the Chinese to link the northern border in Hilsa to southern Nepal via a railway network,” Shahi said. “We have had a few rounds of bilateral talks in past few months.” Dreams of railways are deeply etched into the psyche of leaders, but the sad reality is that less than 100 kilometres of road connecting Hilsa to the district headquarter of Simikot, which started in late 1990s, has not been completed. As the river's level peaks in the summer, it poses serious landslide threats. “We are trapped but we can’t leave this place as we make our living from these hotels,” Pema added. Her hotel started with a couple of tents three decades ago. Now she has three buildings with about 50 rooms. “This is the only property we have and it’s our future, but it’s at risk,” reiterated Pema. In 2012, a landslide killed four people from a family, including a mother and children, just a few hundred metres away from her hotel. She remembers that dark day. 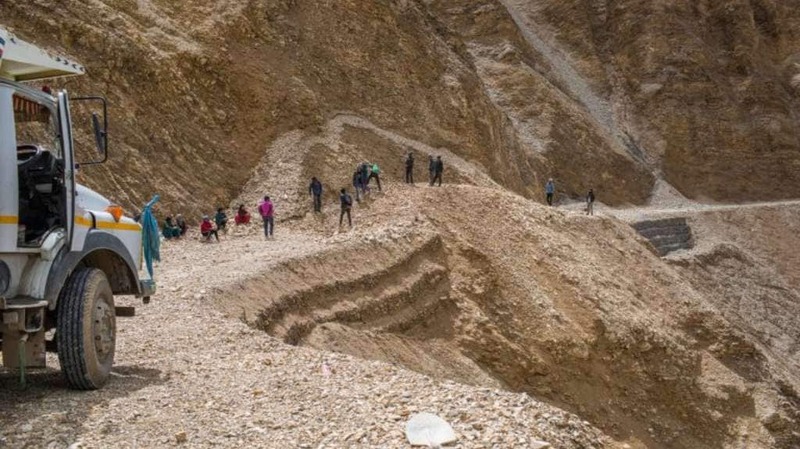 Landslides are the major cause of disasters in Nepal, accounting for about 30 percent of total annual casualties. According to Dave Petley, a landslide researcher at the University of Sheffield in Britain, there were 83 fatalities in 2017 due to landslides. Apart from floods and landslides, studies warn that a mega earthquake is looming in Nepal’s western region after a big quake in the central region in 2015 killed more than 10,000 people. It’s been more than 300 years since the last mega earthquake struck western Nepal. “Seismologists say there are two dangers lurking beneath the Himalaya: one is the unfinished business of 2015, and the other is a looming mega quake in western Nepal,” a report in the Nepali Times stated a few months ago. People in Hilsa used to drink water from the Karnali in the past, but with the development boom in Burang 30 kilometres upstream, this is no longer possible. “We don’t drink water from the river nowadays. It’s polluted by sewage disposed in the rivers upstream,” Pema said. The locals bring water from a nearby spring into their homes through pipes. This source provides water round the year and is the lifeline of the town. “If you litter around the water source, you will be cursed and swell up,” she said when we walked with her to see the source a few hundred metres from her hotel near the bank of the Karnali River. Still shrouded in darkness, with no road connection or mobile network, the locals in the border town of Hilsa face more challenges as development upstream gathers pace. And both the Chinese and Nepali governments ignore the problems facing downstream people. This story is jointly published by thethirdpole.net and Nepali Times. ​The Third Pole is a multilingual platform dedicated to promoting information and discussion about the Himalayan watershed and the rivers that originate there. This report was originally published on thethirdpole.net and has been reproduced here with permission.